Shop Natural Maple Syrup - Little Man Syrup - Secure Amazon Checkout! Our maple syrup is carefully collected from the richest maple trees in the north woods of Wisconsin. You can’t get a more natural sweetener than maple syrup from our trees. Substitute this syrup into any of your favorite recipes to make it more natural and delectable! This 12 oz glass bottle is perfect to stock your pantry or for giving as a gift! UOur maple syrup is carefully collected from the richest maple trees in the north woods of Wisconsin. You can’t get a more natural sweetener than maple syrup from our trees. Substitute this syrup into any of your favorite recipes to make it more natural and delectable! This 32 OZ bottle is a great way to fill the pantry with all natural maple syrup! This classy looking bottle is a great gift for any occasion or to set out on the table as a garnish when you’re having friends over for a meal! This thick glass bottle is filled with our unmatched all natural maple syrup! 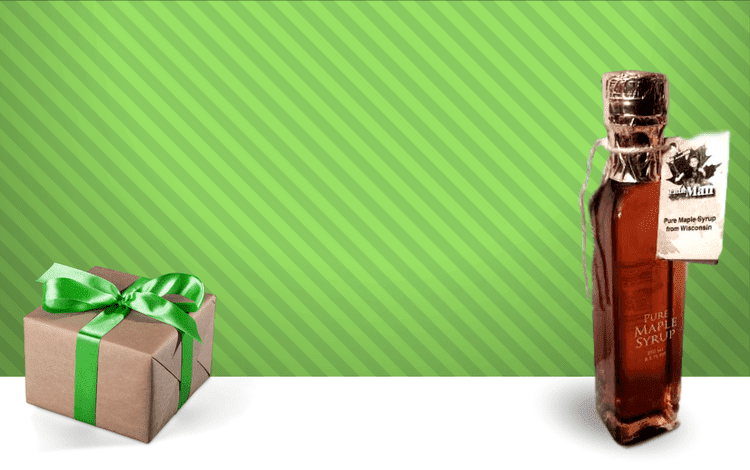 This ritzy bottle filled with all natural maple syrup is a great gift for the boss!….. or anyone else! Cute 1.7 OZ glass handled bottle. Makes the perfect gift or wedding favor! favorite recipes to make it more natural and delectable! Little Man Syrup’s pure maple syrup blended with sweeteners to produce a great tasting and more affordable syrup substitute. This beautiful 3.4 OZ decorative plastic jug was made even better when we topped it off with the best maple syrup produced in the USA! This 32 OZ plastic jug is a great way to fill the pantry with the best syrup produced in the USA! Our tasty and all natural maple syrup is now available in this amazing squeeze bottle. This makes it easy for children of any age to soak their pancakes with just the right amount of maple syrup! Our maple syrup is always available at a great price! 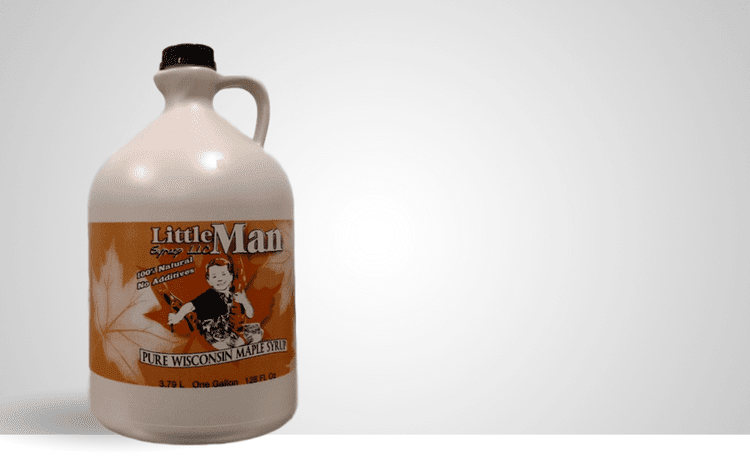 Little Man Syrup is a family owned and operated business located in the Northwoods of Wisconsin. We pride ourselves in making the purest, best tasting maple syrup available today. You can learn even more about our history and operations by vising the “Our Story” page. We are producers, meaning it all starts with our trees and our high quality production process. Once our maple syrup is completed we also take care of our own distribution. We sell our syrup to everyone from large businesses and restaurants to individuals. If you are a bulk syrup buyer you can visit our “Bulk Buyers” page for more information. If you are an individual looking to buy our great syrup for yourself or a friend you can shop our maple syrup here. Little Man Syrup always has and always will strive to create the best maple syrup on the market and to make our customers happy. If there is anything that you think we could be doing better we would definitely appreciate hearing your input. Feel free to contact us in whichever manner is most convenient for you. Thank you so much for taking a look at our website and trying out our all natural maple syrup. Coppyright © 2018 Little ManSyrup.